Andy and Terry live in a treehouse. But it's not just any old treehouse, it's the most amazing treehouse in the world! 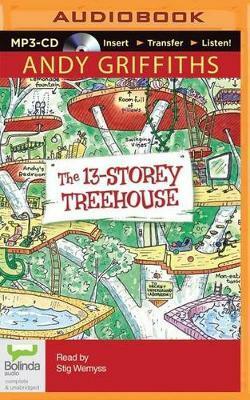 This treehouse has thirteen stories, a bowling alley, a see-through swimming pool, a secret underground laboratory, and a marshmallow machine that follows you around and automatically shoots marshmallows into your mouth whenever you are hungry. Life would be perfect for Andy and Terry if it wasn't for the fact that they have to write their next book, which is almost impossible because there are just so many distractions, including thirteen flying cats, giant bananas, mermaids, sea monsters pretending to be mermaids, enormous gorillas, and dangerous burp gas-bubblegum bubbles!